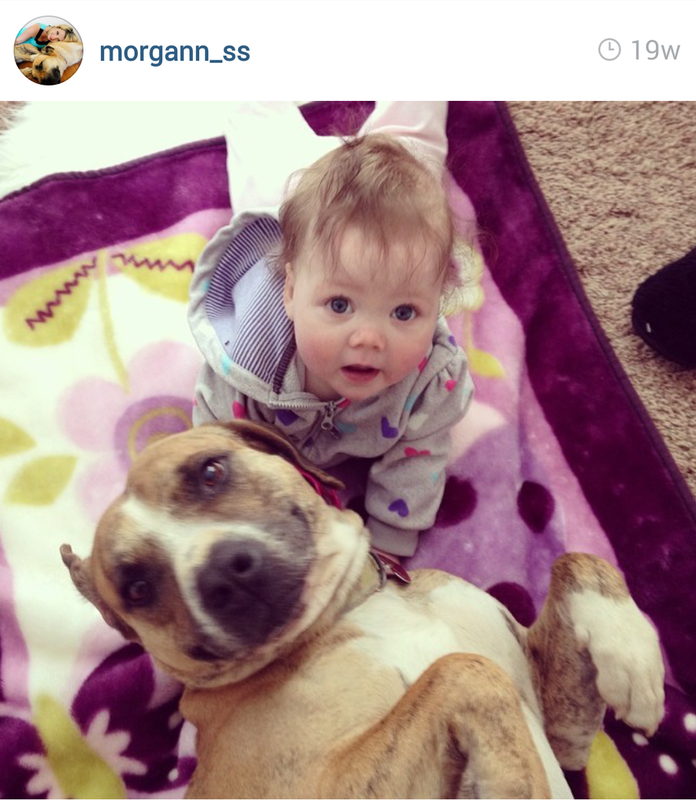 Babies and Pit Bulls: From the Experts Themselves, Parents! 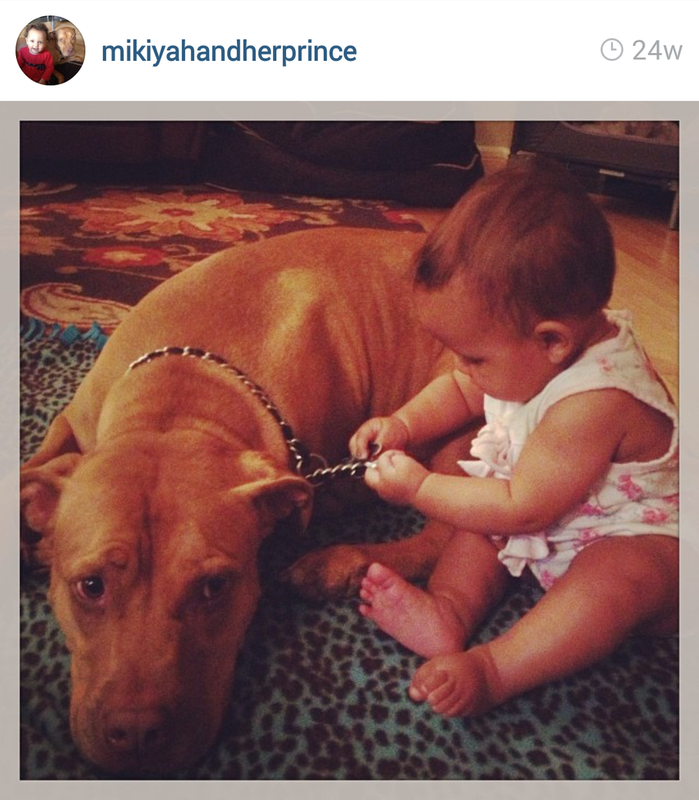 Pit Bulls and Babies. This is a topic that tends to raise eyebrows, especially those of people that do not own Pit Bulls. As a proud Pit Bull owner and a first time parent to my now 2 month old daughter Camille Wynter, I've heard it all from “Oh my gosh! You let that thing around your baby?" to “Wow you must have 911 on speed dial!” to the all time classic “Aren't you scared your baby will get attacked?” and of course "Are you nuts?" Well no in fact, I am not nuts and neither are the other vast amount of parents, first timers and the well seasoned alike, who choose to raise their children with a Pit Bull in the home. 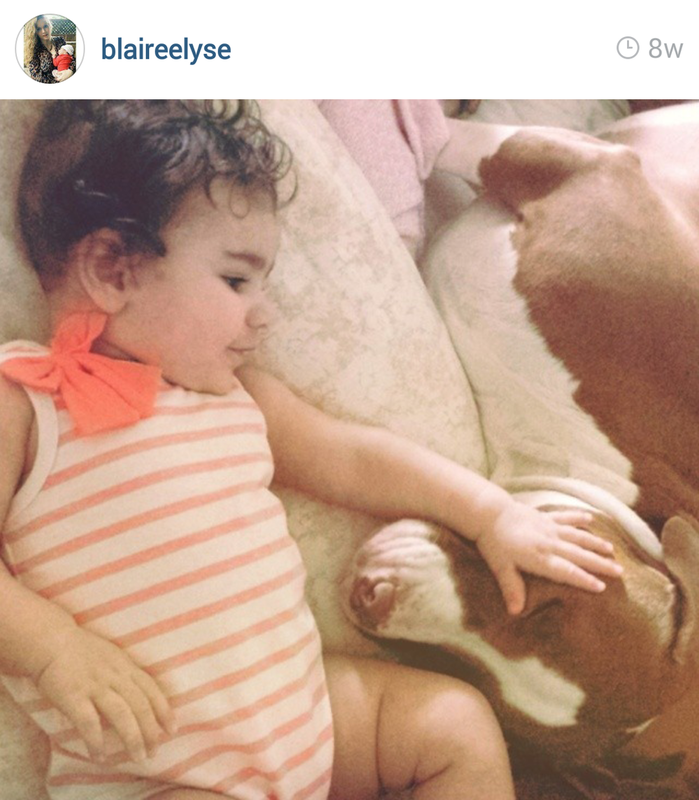 After repeatedly defending my personal choices and my beautiful Pit Bull Bentley, I started to wonder if seeing a Pit Bull around a baby really was such a rare and shock provoking incidence or if it was just that these certain people lived with a rather negative view of these amazing dogs. Then I started wondering how people who were planning on having children felt about the subject and also how people who already had children and Pit Bulls felt. 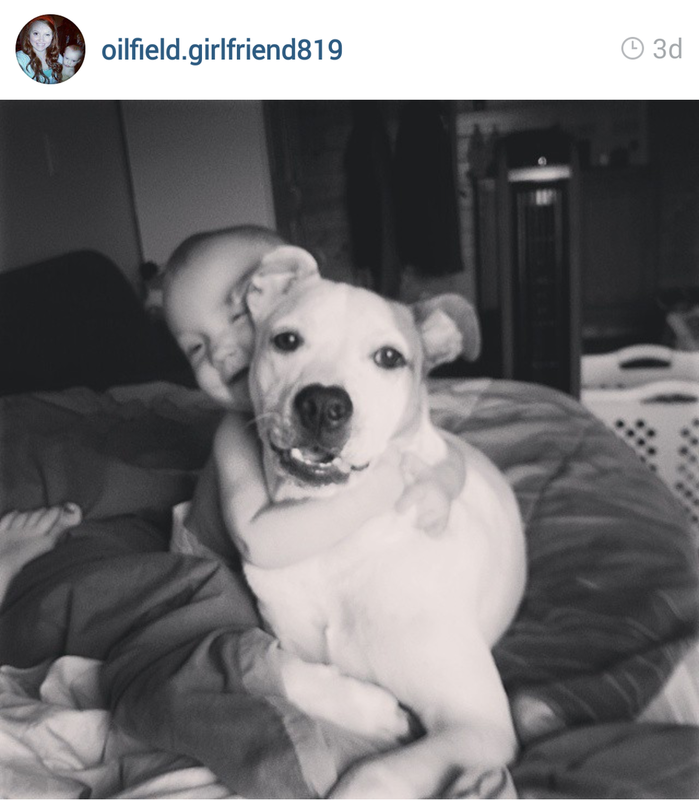 All of the negative comments have pushed me to prove to the skeptics that no, just because you have a Pit Bull around a baby or young child, it does not mean that he will rip their face off. So where do you go when you need help on a specific topic? You go to the source of course. As a parent you always have concerns about the well being of your children. If indeed you are expecting your first child you must be overwhelmed with emotion. There is a tiny person growing inside of you (or your significant other) and it is your duty to provide them with a safe environment filled with love and comfort. Millions of thoughts must be going through your head as it is but then comes the question every dog owner faces: “How will my dog react to my baby?”. You now start thinking about every possible scenario that could happen. You've heard about dogs attacking children and then you look at your own and say “No, he would never hurt a fly.” Well this is very often the case. The majority of dogs do especially well with children, if, and this is important, if you have a trained dog. It does not matter if it is a Pit Bull, a Golden Retriever, a Poodle, a Cocker Spaniel, or a Jack Russell Terrier. Any dog is capable of mauling a child, any. Do not think for once that any breed has a pre determined tendency to do so over another. There are people who get attacked by Chihuahuas all the time (of course these little guys can't cause too much harm now could they?). You want to be sure that you are fulfilling your role as a parent to protect your cub. I personally did not have any concern about my Pit Bull, Bentley, being aggressive since she has never shown any signs of aggression towards anyone, human or animal. Of course I am just one example. With all the questions people ask me about the topic I wanted to know how others felt. I wanted to ask Pit Bull owners and parents specifically about their experiences and share what I have found so that others could see that it is not just a rare scenario, that Pit Bulls do not “eat babies” or any other nonsense you've heard. So I came to you the public asking for complete honesty. I asked if I could share your pictures and your stories and you so graciously responded. Here is what you, the experts, Parents and Pit Bull owners, had to say. After receiving so many wonderful pictures and stories of how parents introduced their Pit Bulls to their babies, you can clearly see that there are different techniques that each parent uses. Each of them knows their own dogs and their behaviors and therefore were able to devise a plan of action that made them comfortable, and that's the most important thing to remember. You have to know what you are comfortable with and what will work for your unique situation. What may work for someone else may not work for you and it is your decision to make. Some parents use the blanket technique while others go down the slow and gradual path. What all these parents, as well as the numerous others who answered, have in common is that not one of them had a negative experience. With a combination of a well behaved dog that you trust, no matter the breed, and adult supervision, you should not have a problem. It is obviously a process that you must get comfortable with first and of course it is a case by case basis. Hearing about all the successful baby introductions conjured up another question. I wanted to know how many parents trusted their Pit Bull 100% around their children, so I asked: "Do you fully trust your Pit Bull around your child?" This question received so many positive responses, even Pit Bull owners who did not yet have children of their own answered. Out of about 100 people that voluntarily answered, the outcome was once again all positive with everyone answering YES, that they did trust their Pit Bull around children. Below are just a few of the responses given. This last response is a great answer because no matter how big or small, or how much you trust your dog, at the end of the day he is still an animal and caution must always be exercised when caring for young children and babies especially. Such tiny, delicate humans need us, their parents to ensure their safety and be good role models. By teaching your children from an early age how to and how not to interact with a dog you are instilling in them the proper ways to behave around any dog, which may be the leading factor in an avoidable circumstance. All of the responses have left me with a sense of pride in the fact that so many of you out there are wonderful parents and you feel confident raising your children with a Pit Bull. A Pit Bull is just a dog. He wants to lick you, love you, receive praise from you and live a normal life with his pack, you, his family. I've read of unfortunate circumstances where a dog has in fact attacked a child and you know what the most common reasons are? 1) The dog was left unsupervised with the child. 2) The child aggravated the dog by pulling on his tail or any such behavior. 3) The dog was not trained. These three things are imperative in the protection of your young. Obviously the first should come as no surprise. Now the second reason is the avoidable one that was stated earlier. Any and every dog owner should do a little research and get to know the mannerisms of a dog. You should know what behaviors to look for in a dog to tell if he is angry or getting aggravated. Some dogs don't mind having their tail or ears pulled while this may cause another dog to growl or even snap. Some dogs are food aggressive, some don't like to release their toys or treats to you. If you know what bothers your own dog you can teach your child and if you generally know the early warning signs or body language a dog gives off, you can avoid a mishap with a stranger's dog. Since dogs do not speak, their body language is an instant indicator of their mood. So please, do you research. While the following is just a short list of what to look for, it may be all you need. The third reason is extremely important. Some people decide to get a cute little puppy but either do not know how to train a dog or just do not follow through with any training. That right there is losing the battle when it comes to Pit Bull owners especially. If you are planning on owning a Pit Bull, or already do, and you haven't trained him or decide that you don't want to bother with it then you are the problem and you should not be allowed to own any dog. You are the reason why these dogs are under such extreme prejudice, like Breed Specific Legislation, which has caused the death or removal of so many dogs and has caused heartbreak for families all around the world. Having a dog in your backyard that doesn't have any social skills and doesn't know any commands is a recipe for disaster. Dogs like this develop aggression and a strong desire to guard their territory from any and everyone. Many of these types of dogs are the reason that attacks happen, so please, please, please train your dog! It is not that hard, it just takes repetition. There are classes you can take your dog to, videos, articles, books, dog trainers... there's NO excuse! 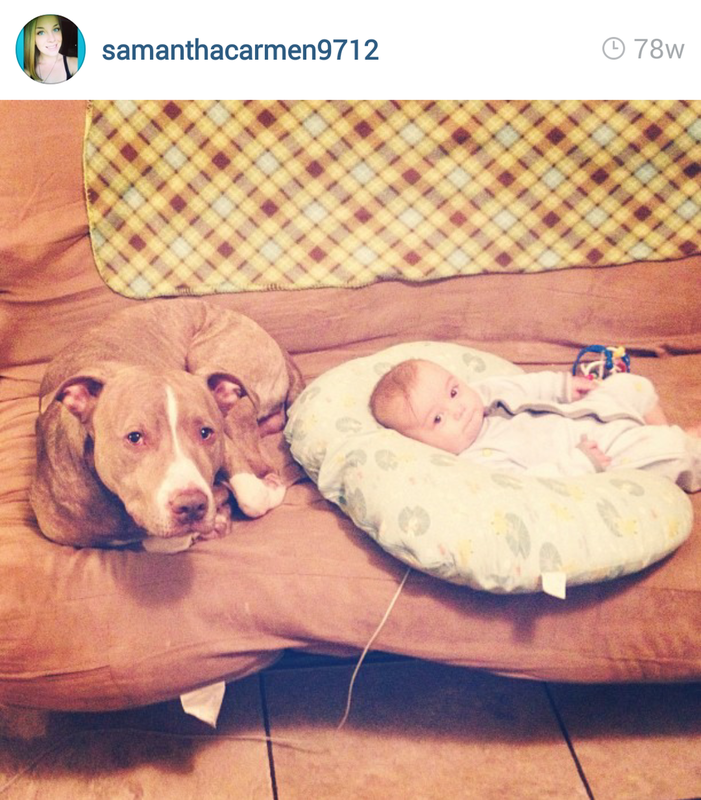 You wouldn't want an untrained dog around your baby would you? Well neither does anyone else and you definitely wouldn't want to be the reason for someone else's heartbreak. Now that you are armed with reassurance from so many responsible parents and Pit Bull owners and know a few warning signs of an aggressive dog and the key factor (training), it is up to you to put the pieces of the puzzle together. If you choose that you want to add a dog, Pit Bull, or any other breed at that, into your home, if you are expecting a child or already have children, do you research. Pit Bulls make amazing companions and everyone that I have encountered that has one is over the moon with them. It is pretty much guaranteed that with a trained and friendly Pit Bull that you have greatly socialized from day one, you will be a happy Mommy or Daddy knowing your child will get to experience the joys of growing up with a great dog. After all, there is a reason the dog is called man's best friend. 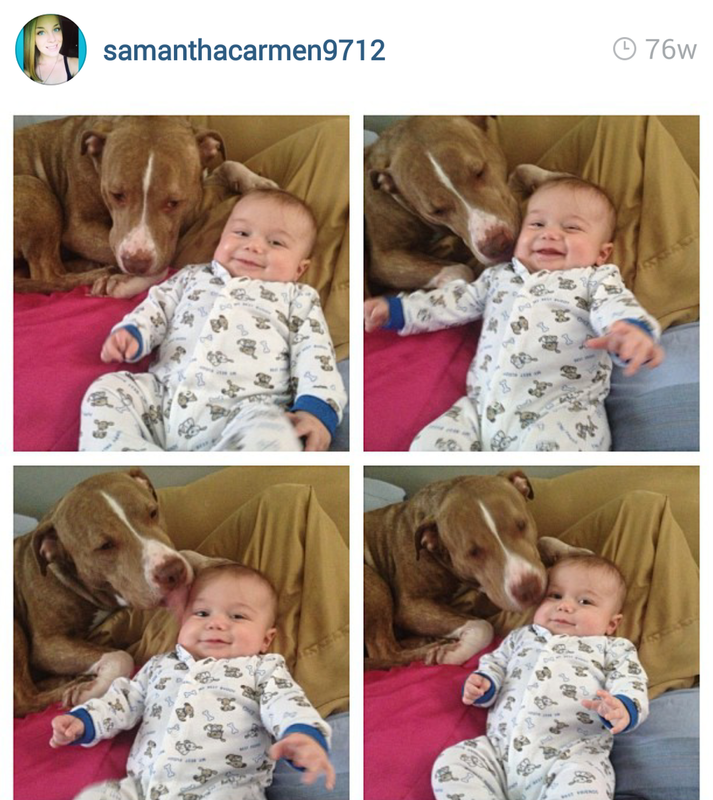 Now If anyone is still a skeptic about having a baby and a Pit Bull in the same home, maybe you should take a look at some more adorable pictures of babies with their Pit Bulls and if you still feel nothing, then maybe, just maybe, you are a robot. Seriously though, have a look at some more cute pictures of little humans interacting with their best buds. 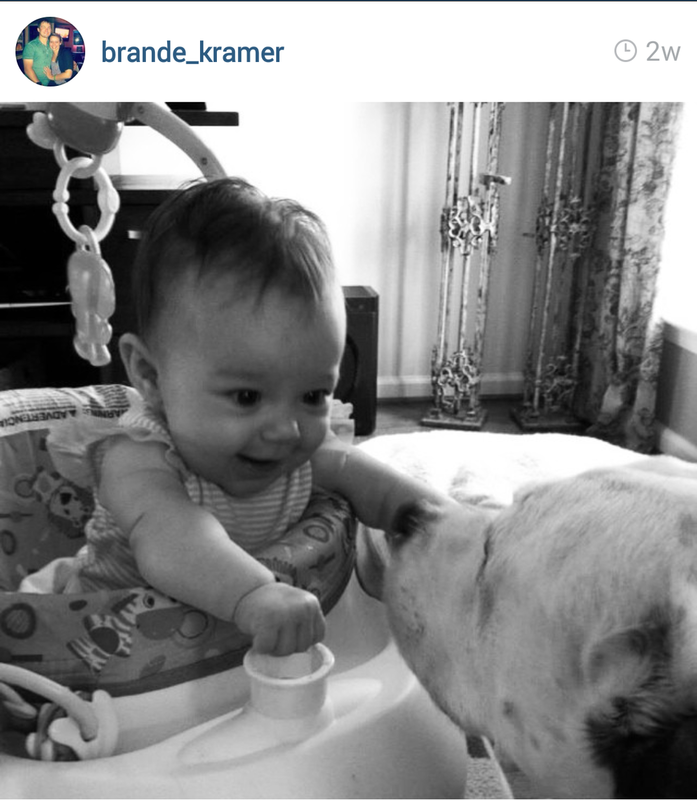 THE CUTEST BABY AND PIT BULL PICTURES EVER! Would you consider adding a Pit Bull into your home after reading this article?